Eaton Canyon Park and Nature Center, Pasadena | Day Trips L.A.
Eaton Canyon Park and Nature Center is more than just a walk in the woods. An easy hike and a nature center with live critters on display, make this a fun and informative half-day outdoor adventure for families. Wildlife, rocks and minerals, plants, and amazing people watching. 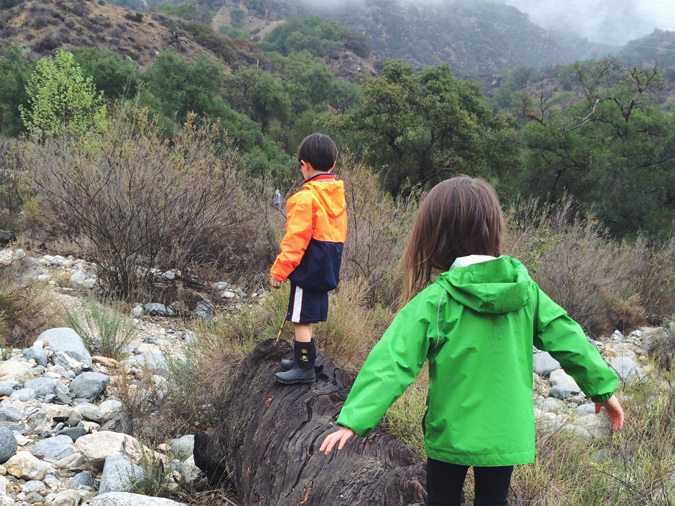 Eaton Canyon is my go-to day trip with the kids. It never gets old. 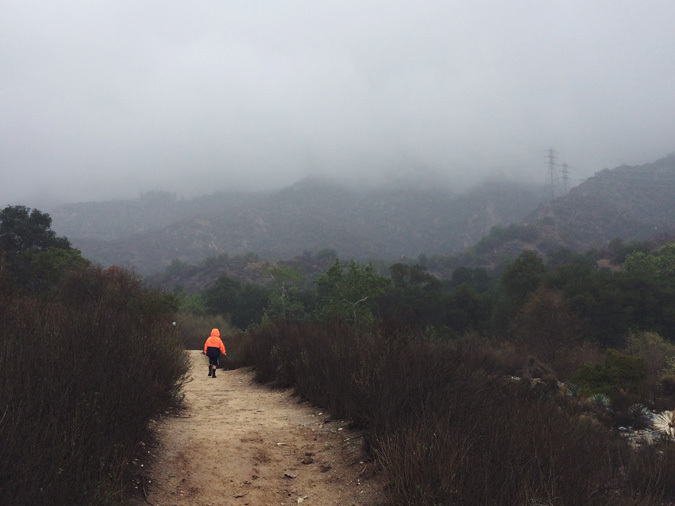 My son leads the way up the Eaton Canyon trail on a cool misty morning. Nature Center reptiles, Eaton Canyon waterfall. Arrive early before it gets too hot and crowded, and go after a rain to see the stream flowing. Have post-hike clothes and shoes in car for kids because they are going to get wet and dirty. Eaton Canyon is a 190-acre natural area at the base of the San Gabriel Mountains managed by the Los Angeles County Department of Parks and Recreation. There are many well-maintained and easily-accessible hiking trails and a great nature center. Water and snacks, and a camera and binoculars. If you have kids under 5 years old, consider a child carrier such as the Kelty Tour. I usually only force my 5 year old to walk to the falls, but I carry her back. I love this nature center. 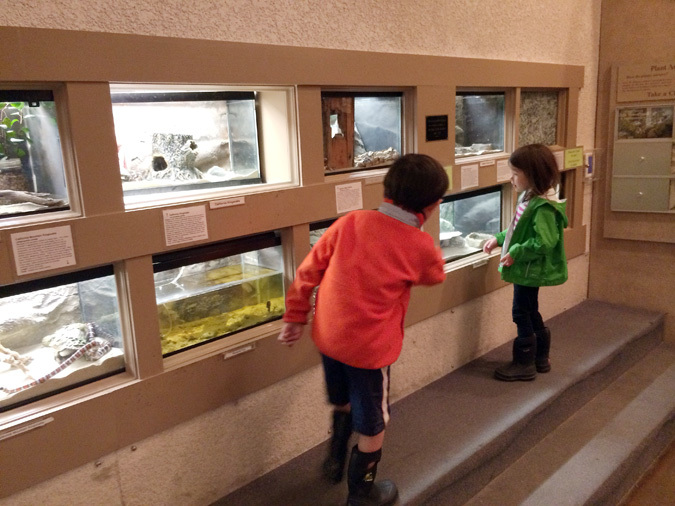 There’s an array of terrariums with live critters like snakes, frogs, toads, and spiders on display. 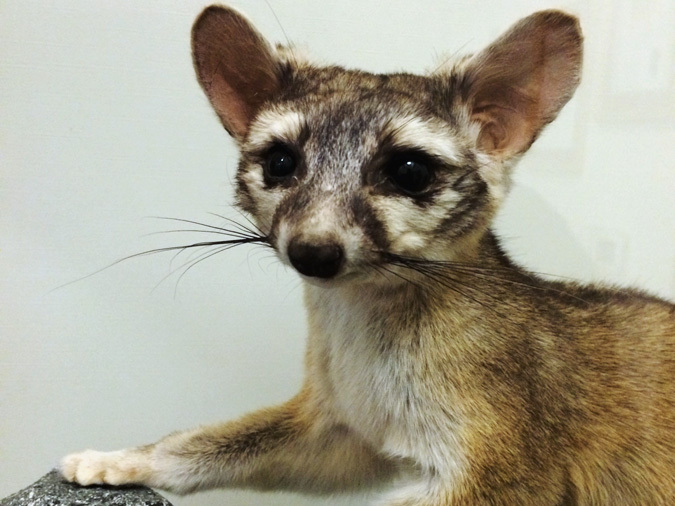 You’ll also find many taxidermy animals and birds, interactive displays, and some early American cultural artifacts too. 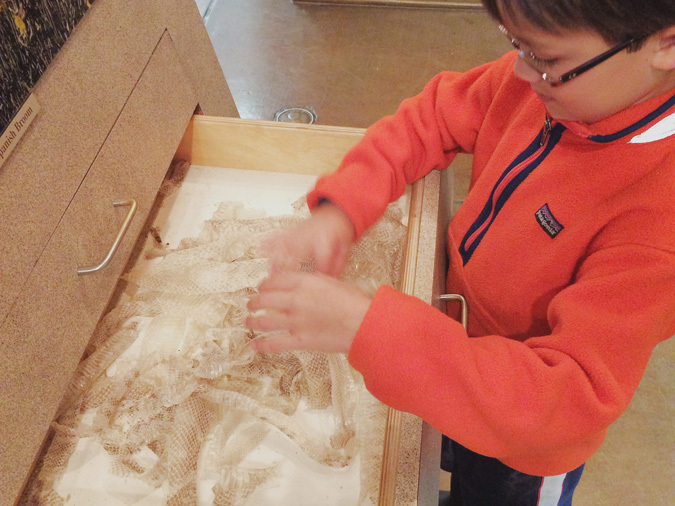 Make sure to open the drawers of butterflies, snake skins, rocks, and other hands-on stuff. Take your time and read information cards on the displays to your kids. Or better yet, ask them to read to you. Grab maps, ask a friendly park ranger person for more info, and buy a souvenir. Eaton Canyon Nature Center terrariums. Snakes, frogs, toads, spiders, and more! 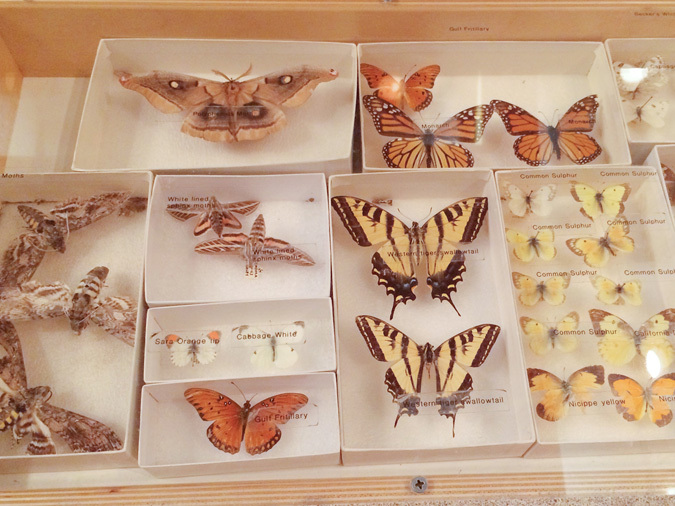 Eaton Canyon Visitor Center butterfly and moth specimen drawers. Eaton Canyon Visitor Center touch display snake skins. Eaton Canyon taxidermy. I should know what this animal is, but I don’t. Walk out of the back of the main parking lot to access the trail. 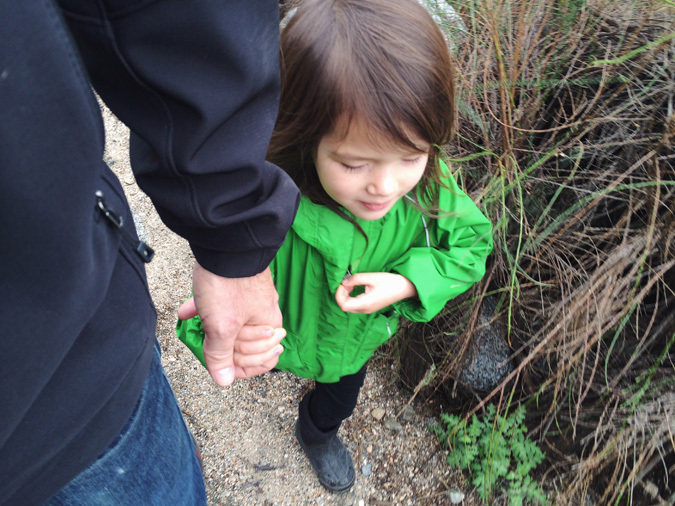 All options lead to the Eaton Canyon stream crossing. Cross the stream and stay to the left if you’re heading to the waterfall. Because we’ve done the hike so many times, we often stay off the trail and walk up the stream bed (aka the Eaton Wash). There’s more to see and less people, but it’s a tougher walk. At the falls, especially in the summer on the weekends, it can get very crowded and a bit out of control. Trails are well-maintained and marked. Hiking is very easy until you get close to the waterfall. Nearer to the falls, some rock-hopping and criss-crossing the stream is required. I’ve seen people pretty far up the trail with kids in off-road strollers such as the BOB. But you’ll have to carry the stroller across the stream shorty after leaving the parking lot before getting on to the main trail to the falls. You cannot make it to the falls with a stroller. Don’t carry your kids, no matter how much they beg. 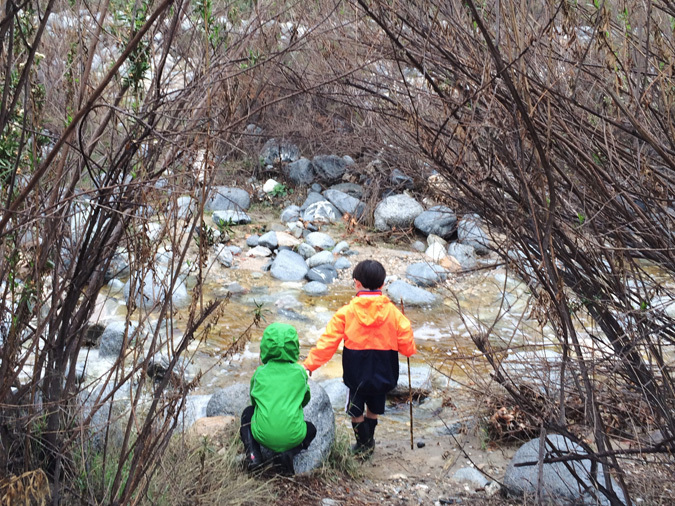 Crossing the Eaton Canyon stream. Bring boots in the winter. Eaton Canyon stream flowing after the one day it rained all winter. Native california plants, wildflowers, birds, reptiles, and deer if you go very early. In the spring, if there’s water in the stream, there are millions of tadpoles. There is evidence of past floods and fires everywhere. 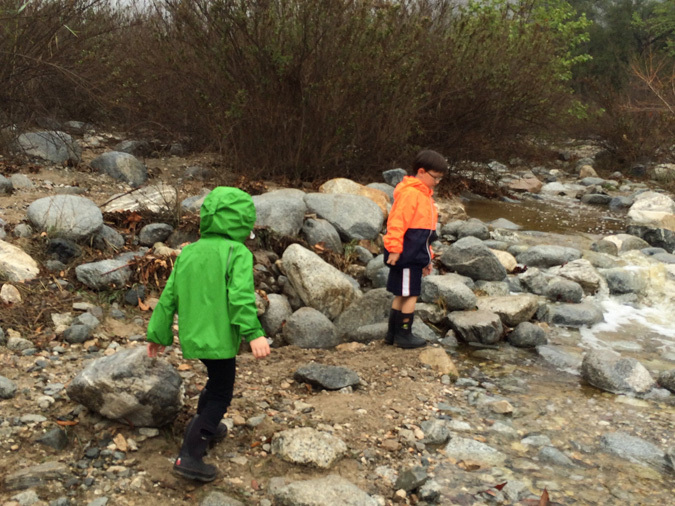 And in the stream bed, I let my kids collect rocks and minerals, aka “gems”. If you stay on the trial, you’ll see lots of people and dogs that you’d never expect out hiking in the woods. Love to see it. Logging time in the Eaton Canyon river bed, aka the Eaton Wash, off the main trail. 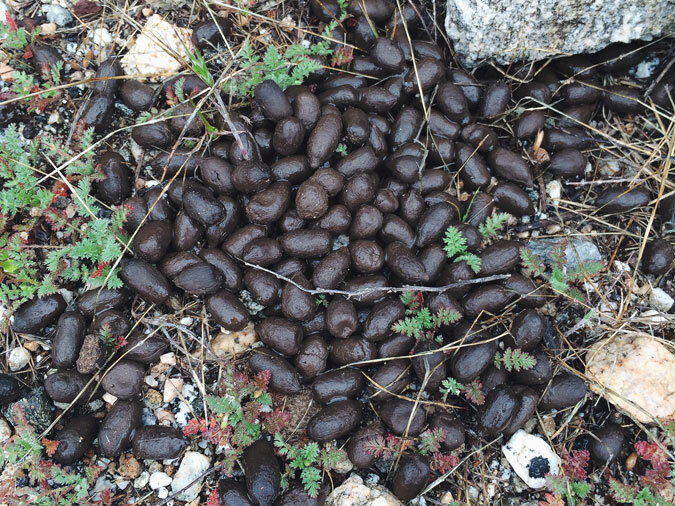 Like or not, deer poop will be what the kids talk about on the drive home. 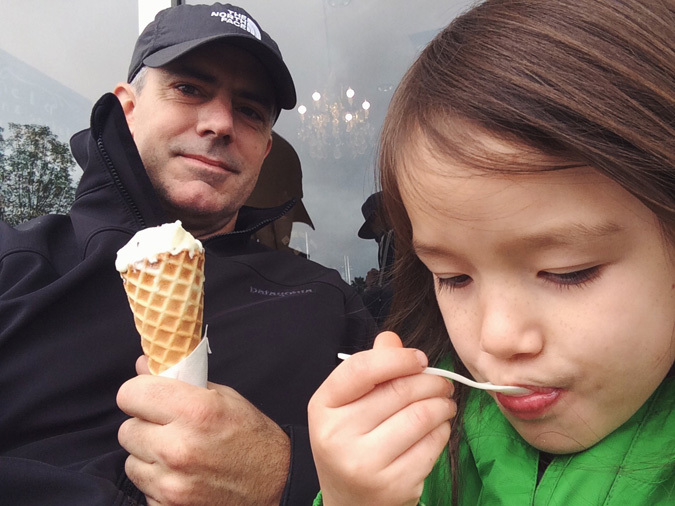 Stop at Carmela Ice Cream just down the road (corner of Altadena/Washington) to reward yourself for getting outside and doing something interesting. Seriously, the best ice cream on the planet. The mint flavor is ridiculous. Stopping at Carmela for some post-hike ice cream. From the 210 Freeway eastbound, exit at Sierra Madre Blvd/Altadena Drive, turn left on Altadena and head North toward the mountains. From the 210 Freeway westbound, exit at San Gabriel Blvd, turn right on Altadena (at the second light) and head toward the mountains. Park entrance is about 1.5 miles from the 210.